Philip José Farmer is perhaps best know for his Riverworld series, but his body of work includes nearly 60 novels and hundreds of novellas and short stories. Time’s Last Gift was originally published in 1972, then revised in 1977, and only recently published again for a whole new generation of fans to discover. The story follows John Gribardsun and three fellow anthropologists as they travel back in time from 2070 A.D. to 12,000 B.C. in order to study primitive man. What they discover is that the impact of their time travel may have greater consequences than any of them could have imagined. This is a hard one to talk about without ruining the story, but it quickly becomes more than a time travel story as we discover Gribardsun is a bigger character in our world history than at first suspected. 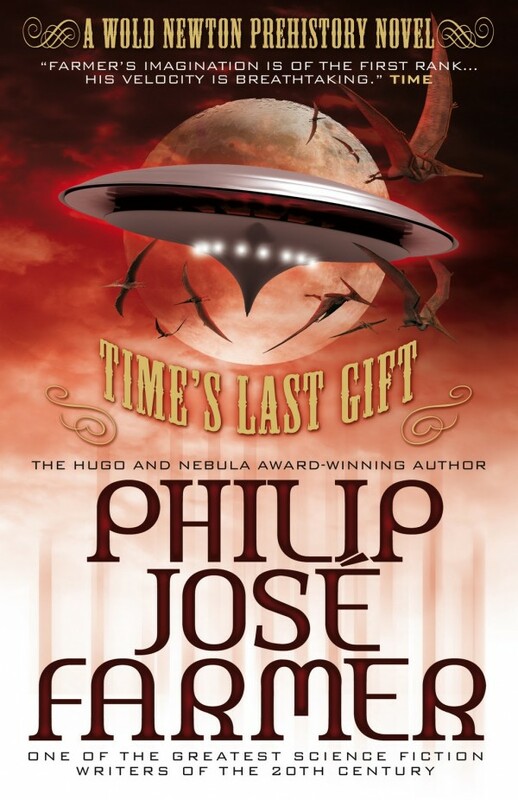 Time’s Last Gift is part of the Wold Newton Universe which includes the newly re-released The Other Log of Phileas Fogg and focuses on people in some way tied to the fictional Wold Newton meteor strike of 1795. It’s not simply a series of books leading one into the other, but a series of interconnected stories with characters created by Farmer interacting with other well known fictional characters. When you read Time’s Last Gift you’re getting two stories at once. The main story of what happens to John Gribardsun and how his actions will affect all of history is what drives the novel. The secondary story is unravelling who he is through clues a discerning reader will delight in finding. It’s a mystery within a mystery. Fans of the Wold Newton Universe who have already read Time’s Last Gift will be happy to see a little something extra in this edition. There’s a wonderful afterward by Christopher Paul Carey and a detailed timeline by Win Scott Eckert called “Gribardsun through the Ages: A Chronology of Major Events Pertinent to Time’s Last Gift” . It’s the kind of thing fans will love, but those new to the books might want to save for later reading so as not to spoil some worthy surprises. Time’s Last Gift is available now for $9.95.